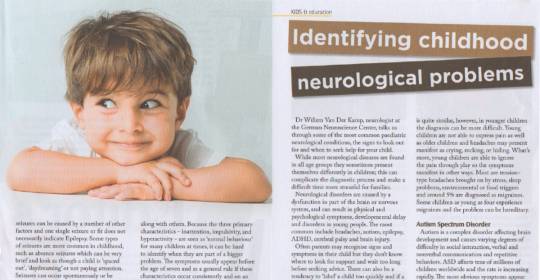 Dr. Willem Van Der Kamp, neurologist at the German Neuroscience Center, talks us through some of the most common paediatric neurological conditions, the signs to look out for and when to seek help for your child. 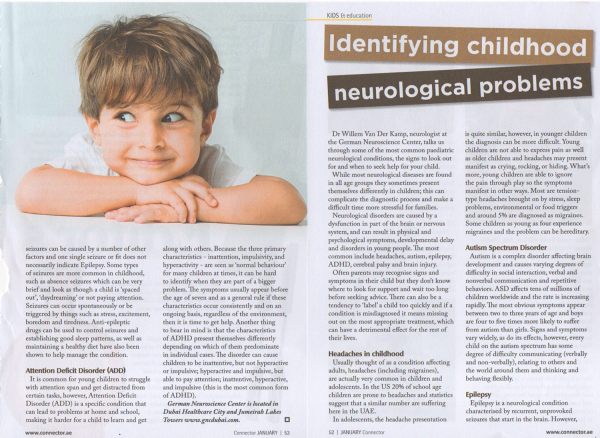 While most neurological diseases are found in all age groups they sometimes present themselves differently in children; this can complicate the diagnostic process and make a difficult time more stressful for families. Neurological disorders are caused by a dysfunction in part of the brain or nervous system, and can result in physical and psychological symptoms, developmental delay and disorders in young people. The most common include headaches, autism, epilepsy, ADHD, cerebral palsy and brain injury. 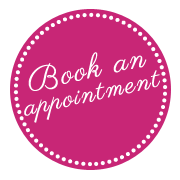 Often parents may recognise signs and symptoms in their child but they don’t know where to look for support and wait too long before seeking advice. There can also be a tendency to ‘label’ a child too quickly and if a condition is misdiagnosed it means missing out on the most appropriate treatment, which can have a detrimental effect for the rest of their lives. Usually thought of as a condition affecting adults, headaches (including migraines), are actually very common in children and adolescents. In the U.S. 20 percent of school age children are prone to headaches and statistics suggest that a similar number are suffering here in the UAE. In adolescents, the headache presentation is quite similar, however, in younger children the diagnosis can be more difficult. Young children are not able to express pain as well as older children and headaches may present manifest as crying, rocking, or hiding. What’s more, young children are able to ignore the pain through play so the symptoms manifest in other ways. Most are tension-type headaches brought on by stress, sleep problems, environmental or food triggers and around 5 percent are diagnosed as migraines. Some children as young as four experience migraines and the problem can be hereditary. Autism is a complex disorder affecting brain development and causes varying degrees of difficulty in social interaction, verbal and nonverbal communication and repetitive behaviors. ASD affects tens of millions of children worldwide and the rate is increasing rapidly. The most obvious symptoms appear between two to three years of age and boys are four to five times more likely to suffer from autism than girls. Signs and symptoms vary widely, as do its effects, however, every child on the autism spectrum has some degree of difficulty communicating (verbally and non-verbally), relating to others and the world around them and thinking and behaving flexibly. Epilepsy is a neurological condition characterised by recurrent, unprovoked seizures that start in the brain. However, seizures can be caused by a number of other factors and one single seizure or fit does not necessarily indicate Epilepsy. Some types of seizures are more common in childhood, such as absence seizures which can be very brief and look as though a child is ‘spaced out’, ‘daydreaming’ or not paying attention. Seizures can occur spontaneously or be triggered by things such as stress, excitement, boredom and tiredness. Anti-epileptic drugs can be used to control seizures and establishing good sleep patterns, as well as maintaining a healthy diet have also been shown to help manage the condition. It is common for young children to struggle with attention span and get distracted from certain tasks, however, Attention Deficit Disorder (ADD) is a specific condition that can lead to problems at home and school, making it harder for a child to learn and get along with others. Because the three primary characteristics – inattention, impulsivity, and hyperactivity – are seen as ‘normal behaviour’ for many children at times, it can be hard to identify when they are part of a bigger problem. The symptoms usually appear before the age of seven and as a general rule if these characteristics occur consistently and on an ongoing basis, regardless of the environment, then it is time to get help. Another thing to bear in mind is that the characteristics of ADHD present themselves differently depending on which of them predominate in individual cases. The disorder can cause children to be inattentive, but not hyperactive or impulsive; hyperactive and impulsive, but able to pay attention; inattentive, hyperactive, and impulsive (this is the most common form of ADHD).